White Steel baseboard return with a smaller faceplate than standard baseboard grilles. Imperial baseboard return has an overall depth of 7/8 inch. This smaller faceplate baseboard return works great in areas where you have limited space for the faceplate. Your baseboard return vent does not require professional help when trying to install. 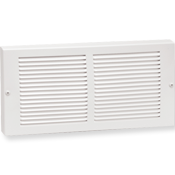 Our metal air grilles are equipped with 2 pre-drilled screw holes on each side of the faceplate. The baseboard returns also come with screws so that all you must do is insert into the hole and screw into place. For just one low shipping cost, these metal air grilles can be shipped straight to your home or office! Depth from wall is 7/8"
Tip: When ordering the metal air grilles, do not use measurements of your existing grill. Order your baseboard return by the hole opening in your wall since a 14 x 6 grill will cover a 14 x 6 hole size. We also have metal air grilles available in a brass or pewter finish for a more decorative touch in your home.